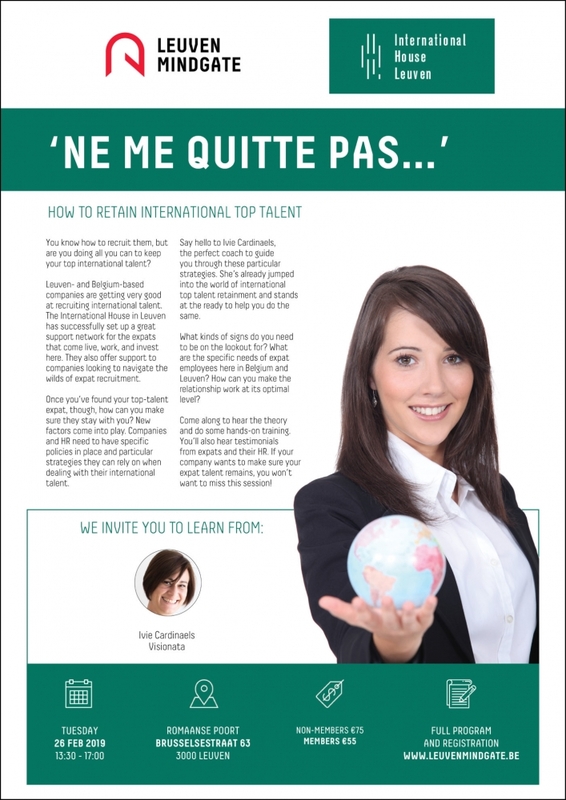 You know how to recruit them, but are you doing all you can to keep your top international talent? Leuven- and Belgium-based companies are getting very good at recruiting international talent. The International House in Leuven has successfully set up a great support network for the expats that come live, work, and invest here. They also offer support to companies looking to navigate the wilds of expat recruitment. Once you’ve found your top-talent expat, though, how can you make sure they stay with you? New factors come into play. Companies and HR need to have specific policies in place and particular strategies they can rely on when dealing with their international talent. Say hello to Ivie Cardinaels, the perfect coach to guide you through these particular strategies. She’s already jumped into the world of international top talent retainment and stands at the ready to help you do the same. What kinds of signs do you need to be on the lookout for? What are the specific needs of expat employees here in Belgium and Leuven? How can you make the relationship work at its optimal level? Come along on the afternoon of 26 February to hear the theory and do some hands-on training. You’ll also hear testimonials from expats and their HR. If your company wants to make sure your expat talent remains, you won’t want to miss this session!